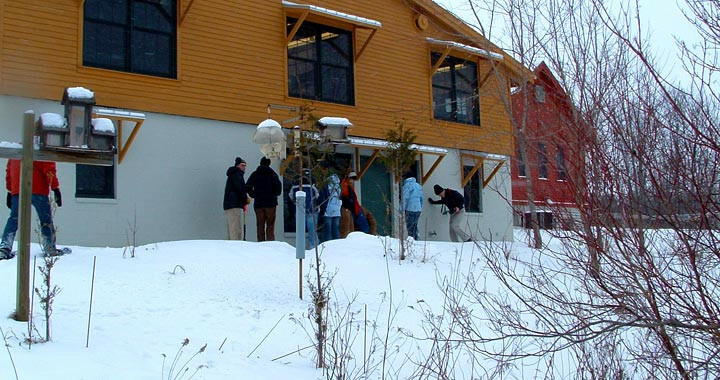 UWM's Field Station is a research and educational facility featuring 2,000 acres of undisturbed, high-quality natural communities used as part of research studies, classroom learning, and public outreach. Located primarily in Saukville, Wisconsin, about 45 minutes north of the main UWM campus, the Field Station manages multiple sites. The Cedarburg Bog is one of the largest and most biologically interesting wetlands in southern Wisconsin and is home to the southernmost string bog in North America. The Sapa Bog is an acidic black spruce bog. The Upland Habitats contain one of the few mature beech-maple forests remaining in southeastern Wisconsin. Like the Cedarburg Bog, the beech-maple forest has been designated a State Natural Area and is classified as a National Natural Landmark by the US Department of Interior. Closer to main campus, the Field Station manages the Downer Woods Natural Area, an 11.1 acre fenced forest along Downer Avenue on the East side of Milwaukee. The Field Station's Neda Mine is in Dodge County, northwest of Milwaukee. It is an abandoned iron mine and the site of the largest bat hibernaculum in the Midwest. In cooperation with the Wisconsin Department of Natural Resources, the Field Station is monitoring environmental conditions and bat activity patterns at the mine. Benedict Prairie is in Kenosha County and features remarkably diverse flora in its 6-acre tract of virgin prairie along a railroad right-of-way. In addition to research and teaching activities, the Field Station, along with the nonprofit Friends of the Cedarburg Bog, sponsor numerous events and activities to raise awareness of the exceptional natural resource available to the public. Nature hikes, workshops, guided treks, and a newsletter are just some of the groups' outreach efforts.